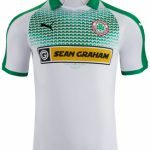 The new Cliftonville away kit is now on sale. 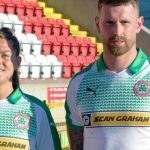 Unveiled at an exclusive launch event at Solitude this evening, supporters reacted quickly to snap up replica shirts and ensure they were the first owners of what will doubtless prove a hugely popular addition to the Reds’ catalogue. 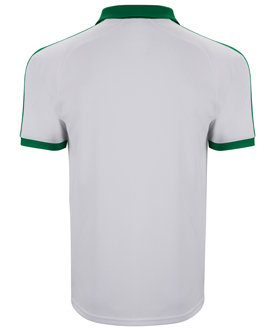 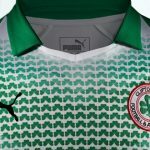 Representing our status as Ireland’s Oldest Football Club as we embark upon our 140th season, the strip comprises a white jersey with emerald green trim, collar and a chest-panel of shamrocks that promises to catapult this kit into iconic cachet among Reds fans, football enthusiasts and aficionados of Irish sporting history alike. 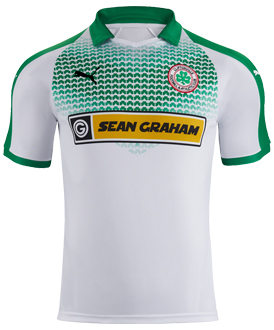 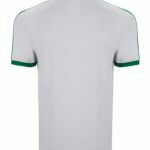 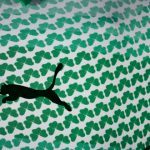 Complemented by emerald green shorts and socks, the reverse strip – which will make its debut when Cliftonville face Nordsjælland in the second leg of next month’s Europa League First Qualifying Round tie – is available for online purchase right now and will also be on sale from The Reds Shop between 7.30-8.30pm on Thursday.